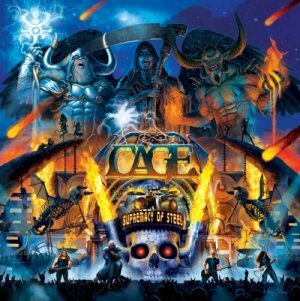 CAGE - SUPREMACY OF STEEL (CD) | Online Shop | Wizard LTD. Album: "SUPREMACY OF STEEL (CD)"
2011, Cage have once again struck gold and forged their sixth release of pure metal magic. Entitled SUPREMACY OF STEEL, Cage has leapt forward another giant step on the path to metal greatness by once again delivering a heavy metal monstrosity. Known for crafting great memorable songs, capturing the essence of classic the NWOBHM sound, and always sounding unique and modern, Cage somehow effortlessly shows how the limits of the genre can be pushed without losing what makes the heavy metal sound great. Throughout the tracks, all the smashing Cage elements are found along with fresh new surprises that are tastefully sprinkled about in just the right fashion.